Here is a guide to materials handling equipment. This article is for professionals new to materials handling equipment to gain a basic understanding of the names, terms and uses of various types of equipment for moving and storing products in a warehouse environment. A forklift is a powered piece of equipment designed to lift and transport material in an industrial setting. Other names for a forklift are: Tow-motor, lift truck, industrial truck, cherry picker and others. A forklift can be a very versatile and useful piece of equipment and the wide variety of attachments that can be added to a forklift make them even more useful. There are numerous types of forklifts and they will be discussed in this text. The intent of this is to give the reader a good working knowledge of the types of forklifts and the nomenclature associated with the components of a forklift. What types of forklifts are there? There are several different types of forklifts. The model that any one operator would use depends on their application. Most forklifts are designed to work in a specific application but sometimes they can be multi-use. The types and applications of some of the more common forklifts are as follows. • Lift code 1 – Counterbalanced rider type, stand up. • Lift code 4 – Three wheel electric, sit down. • Lift code 5 – Counterbalanced rider, cushion tire sit down. • Lift code 6 – Counter balanced rider, sit-down rider (includes pneumatic tire models). Class 2 forklifts are electric motor narrow aisle trucks with solid tires. Class 3 forklifts include electric hand trucks or hand/rider trucks with solid tires. Class 4 forklifts are Internal Combustion Engine sit down rider forklifts with cushion tires and generally suitable for indoor use on hard surfaces. Class 5 forklifts are Internal Combustion Engine sit down rider forklifts with pneumatic tires. These are typically used outdoors, on rough surfaces, or significant inclines. Class 6 forklifts can either be electric or Internal Combustion Engine powered. These are ride on units with the ability to tow at least at least 1000 pounds. This class is designed to tow cargo rather than lift it. Class 7 forklifts are rough terrain trucks with pneumatic tires. Class 7 trucks are almost exclusively powered by diesel engines and are used outdoors. These trucks are typically used indoors in applications such as manufacturing, warehousing, bottling and trucking. They ride on solid rubber tires called cushion tires. They can be powered by either Liquid Petroleum Gas (LPG), gasoline, Diesel, or be dual fuel. Dual fuel means that the forklift is equipped with both LPG and Gas fuel systems and can be run on either one but not at the same time. The engine powers all the functions of the truck, drive and hydraulics. 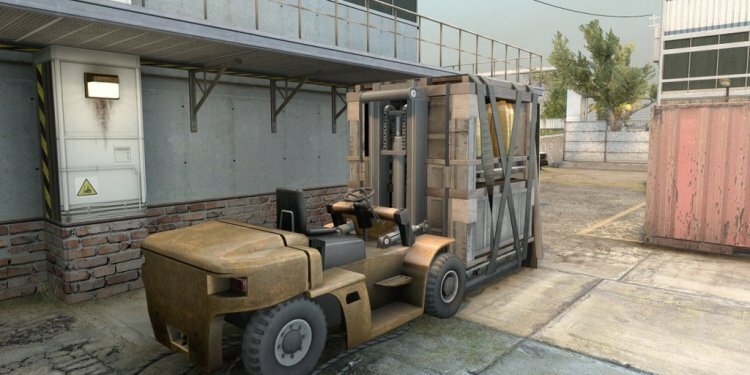 This is a Class 4 forklift. The truck mounted forklift is a very versatile forklift. It is mounted on the back of a truck and can be carried to the worksite and dismounted there to unload the product right at the site making it unnecessary for the customer to have a forklift at the construction site. One notable feature of this type of forklift is that the lift cylinder is normally a double acting cylinder. This means that the cylinder is pressurized when raising or lowering the forks. This enables the forklift to lift and lower itself using the hydraulics and the forks. It can be loaded or unloaded from a truck in a matter of minutes. This type of forklift is very popular with lumber yards, brick yards, and sod farms. A rough terrain forklift is designed for carrying material over terrain that a normal pneumatic tired forklift will not. The most notable feature of the rough terrain forklift is the oversized, aggressive treaded tires. This enables the machine to traverse bumpy, soft or muddy terrain without getting stuck. Many models of rough terrain forklifts are also 4-wheel drive. A rough terrain forklift is a Class 7 forklift. This type of forklift is designed primarily for indoor use. It is powered by a large industrial battery. All the functions (drive and hydraulics) are controlled electrically. It looks much like its IC powered counterpart. The drive system and hydraulic systems are driven by electric motors. They can come in 3 or 4 wheel configurations. While most electric sit down riders use cushion type tires, some are ordered with a solid pneumatic tire and wheel combination. The four-wheel versions are Class 4 forklifts. A narrow aisle forklift is designed to operate in warehouses. It is a stand-up forklift meaning that the operator is standing up while operating the machine. Its primary function is pulling and placing products on racks inside a warehouse. It is normally not used to load trucks. A narrow aisle forklift can operate in aisles between racking that is spaced closer together than the rack spacing required for a sit down rider. Applications: Grocery, Distribution and warehousing. A narrow aisle reach truck is a forklift that works in a narrow aisle and uses a pantograph to extend the forks out from the upright. When extended, the forks are past the load wheels. There is also a double reach trucks which has an additional segment in the pantograph which allows the forklift to pick and place loads two deep on pallet racking. An order selector is also called an “orderpicker”, “stockpicker” or a “cherrypicker” man up forklift truck. This is because the operator actually rides up on the platform so that his feet are at the same height as the forks at any given time. This machine is used in warehouses to “pick orders”. In other words, the operator will go up to the level that the product desired is stored and physically pull the items desired and place them on a pallet or platform that is sitting on the forks.